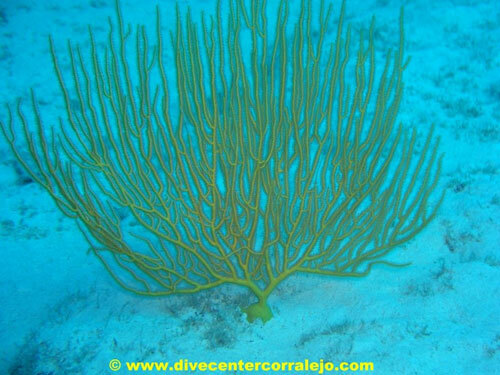 The Gorgonians is named after the forest like amounts of yellow sea fans that decorate the bottom of this dive site. One mile from Las Anclas, and 18 minutes by boat, you will find a low reef which follows a similar route. The reef is approximately two to three meters high, and lies in a depth of approx 28 meters. The most outstanding feature of this dive is the large amount of yellow sea fans (Las Gorgonians) which can be found all over this reef. In places there are so many that they almost form a forest. They resemble small trees approx one meter high. Similar species of fish can be found here as can be found at Las Anclas. This dive site could be considered as an advanced site due to its depth and the occasional strong current found there.